The Mutare market is situated in Sakubva and it is called MusikaweHuku. This market was initially located where there is the T.M complex presently. This market started because that was the place where buses would rank. Farmers would come inSakubva with their produce as chickens, birds, grains and all the products they would have harvested. They would sell to the people who lived in Sakubva. Sakubva was one of the first locations that was established, where most black people were located and this is where a quarter of the populants in Mutare are located. The market then moved from where the complex was constructed to its present location. The wholesale market was the first market to be constructed in 2000 and some of the traders managed to get some stalls in that wholesale shade where they could operate from. This resulted in other traders selling from the ground next to Sakubva stadium. This ground was fenced and the authorities wanted it to be a farmers market. The authorities that is the city council tried to make sure that this market would open early in the morning and close at eleven a.m. However this did not happen for a long time and it resulted in the market opening the whole day because they were a lot of traders whilst the space to operate in was small. Sakubva’s most famous attraction is the SakubvaMarket, also referred to as MusikaWahuku which means the ‘Chicken market.’ The market has the largest food and vegetable markets, traditional artwork, and a second-hand clothing market. 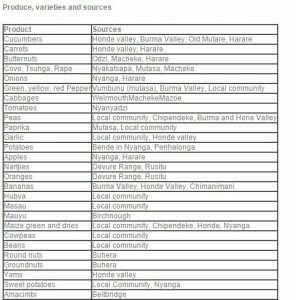 All the products that the traders get from Harare are mainly coming from South Africa. The local community being referred to are the communal farmers that are located close to the city or the resettled farmers in the resettlement areas such as Odzi, Mutasa,Chigodora. Some of the fruits are seasonal and they become scarce at some point in time. These are mainly wild fruits and other vegetables. In the wholesale market there are close to 250 traders and in Chipangano market there are about 300 traders. In both markets three quarters are women and a quarter are men. The traders in the market are selling different products. Some sell almost everything on their tables whilst others sell a single product such as tomatoes or bananas. The revenues that they get differ from one individual to the other. Other traders have good customer care and they have more clients than others. Those traders that sell potatoes can sell their produce and get an average $1000.00 a day. Those who sell vegetables can get an average of $60-$80 a day. Those traders who sell a single product such as bananas can get an average of $40 a day. Revenues in the market are determined also by the time of the month, Pay days for civil servants are busy day and the traders tend to sell more up to the end of the month.